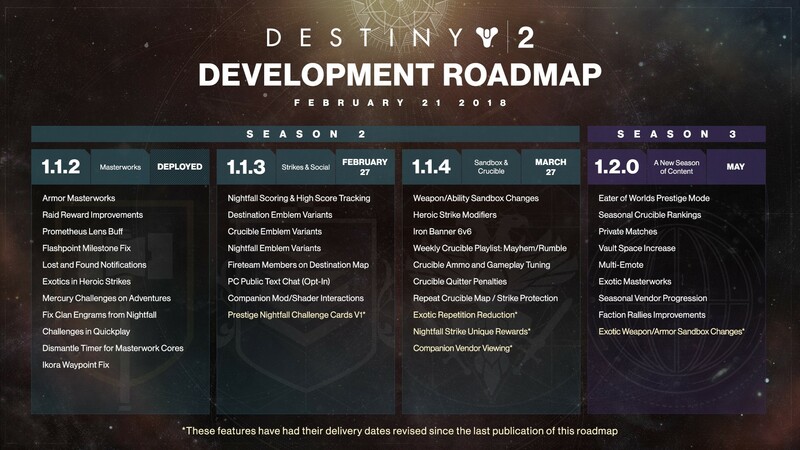 Destiny 2's recently-announced development road map is already seeing some changes this week ahead of next week's 1.1.3 update, game director Chris Barrett announced. One of the upcoming changes is that a feature previously announced for next week's update, Nightfall Strike unique rewards, has been pushed back to the 1.1.4 update scheduled for March 27. "With today’s update we’ve moved a few items out to later releases–this is because we are trying to ensure each feature we add hits a sufficiently high quality bar," Barrett said. "So while we really wanted to get Nightfall Strike Unique Weapons into your hands next week to coincide with Nightfall Scoring, it’s more important that each of those rewards live up to the difficulty it will take to earn them. "They have to be super cool, so we’re giving the artists extra time to make sure they are...super cool. Mod System Improvements are also still planned, but will not be available when 1.2.0 is released. We’ll give more details on when to expect these changes at a future date." Indeed, another big delay is the promised improvement to the mod system, which has been longed for by players for months. Companion vendor viewing is another feature that was pushed back to the end of March as well, and changes to the sandbox and Exotics has also been pushed back to update 1.2 in May. In short, there are less features coming next week and in March, but a bit more to look forward to in updates 1.1.4 and 1.2.0 in May. That's when the game's second expansion is due to launch. Some good news, though, is that the Rumble game mode will be making its way to the game in 1.1.4 alongside six-vs.-six Iron Banner and Mayhem in the new rotating weekly Crucible playlist.